We are manufacturer of Rare Earth Alloy Wear-resisting Casting Pipe and supply high quality Rare Earth Alloy Wear-resisting Casting Pipe in both large and small quantities worldwide and offer you the best prices in the market. 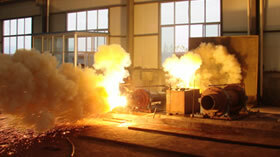 High chromium cast iron pipe is an alloy steel intended for high temperature and high pressure services. We are manufacturer of Rare earth alloy wear-resistant pipe bending and supply high quality Rare earth alloy wear-resistant pipe bending in both large and small quantities worldwide and offer you the best prices in the market. The rare-earth wear-resistant steel had occupied the main position. With high strength, good toughness, corrosion resistance, weldability well, the process is using the most advanced centrifugal casting, long life, under the same conditions than the high manganese steel materials, wear the unit around one-third of the high manganese steel, high manganese steel service life is three times above. Bends and branches seamless steel pipe sections with supporting the use, installation and maintenance more convenient. Rare high-strength low-alloy heat-resistant, wear-resistant steel parts for the power plant boiler systems in coal, powder, ash slagging pipeline. Packed in wooden crates, wrapped in plastic, and suitably protected for sea-worthly delivery or as requested.